My entire life, I’ve dreamed of the day I would move away from Maine, preferably to a city. I don’t like being relatively isolated, having to drive significant distances to get to anything interesting or unusual, and being years behind trends in food and fashion. Luckily within a few months I’ll be in The Very Big City Itself and will be able to wander out for obscure ingredients on a whim, but for now I’m somewhat limited in what I can get without ordering from halfway around the world. Last-minute ideas can be really tasty. After my first entry in this month’s Iron Cupcake challenge, I wanted to do some actual cakes. I had what I thought was a really brilliant idea for sushi-inspired fatt koh (steamed Asian rice cupcakes) with candied carrots and blobs of spicy ginger frosting. I was even going to rig up a steamer with a colander and a giant soup pot. But unfortunately you need something called Eno Fruit Salt to make fatt koh (it’s a flavored leavening/antacid) – allegedly they turn out brownish and ugly if you use baking soda. I can almost smell it through the screen. Trust me, they're fragrant in the best possible way. However, after a loooong trip to the closest Asian market (in Portland – an hour away from where I live now) left me fruit-salt-less, I had to come up with a backup plan. Well, I didn’t really, since I already have an entry in, and participation isn’t mandatory, but that’s just me. 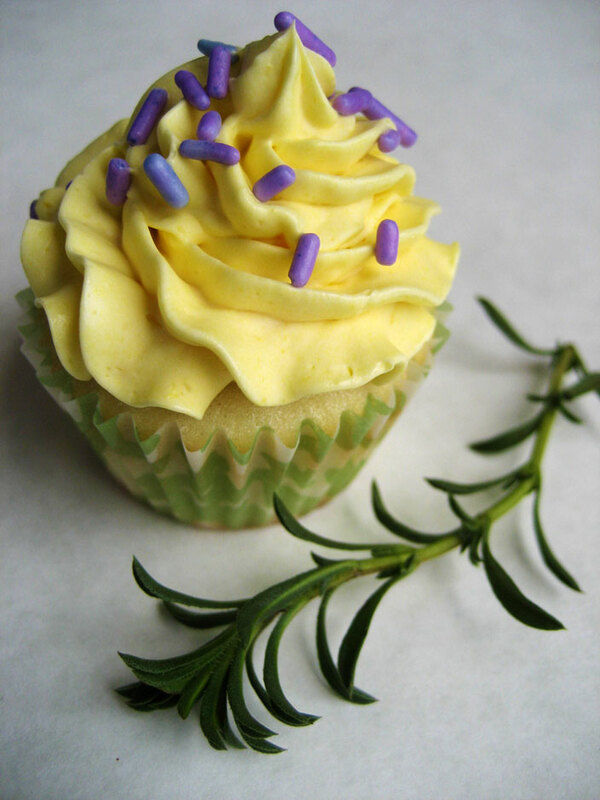 While driving from the Old Port to Whole Foods (only after buying a bunch of things I can use but definitely don’t need at the Asian market), I came up with a classic smartass Anna idea – why not just use the herb savory in my cupcakes? Is it time for a picnic? 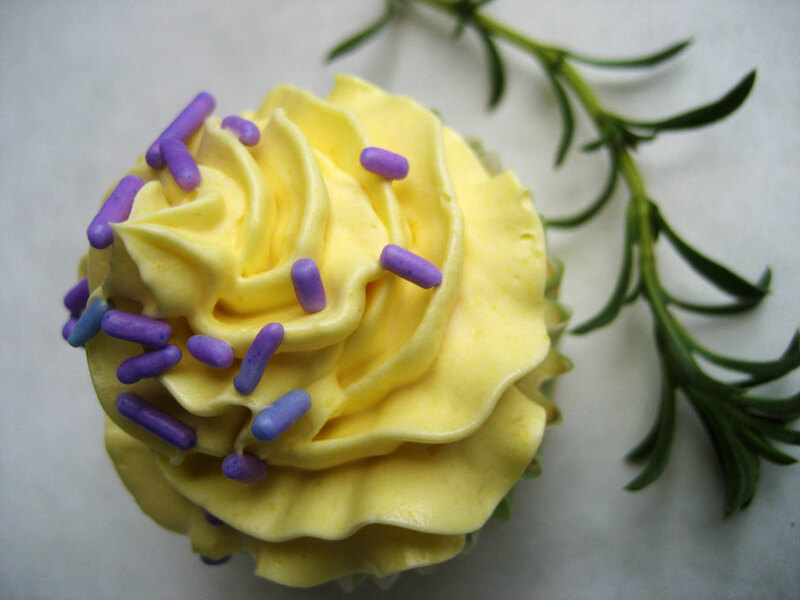 There aren’t a lot of cakey things that go well with savory (it’s called savory for a reason, I think), but I figured that it wouldn’t hurt to pair it with lavender, and a little lemon, and heck, how about some honey? That's some of that there fresh savory, if you couldn't tell. Not pine twigs. 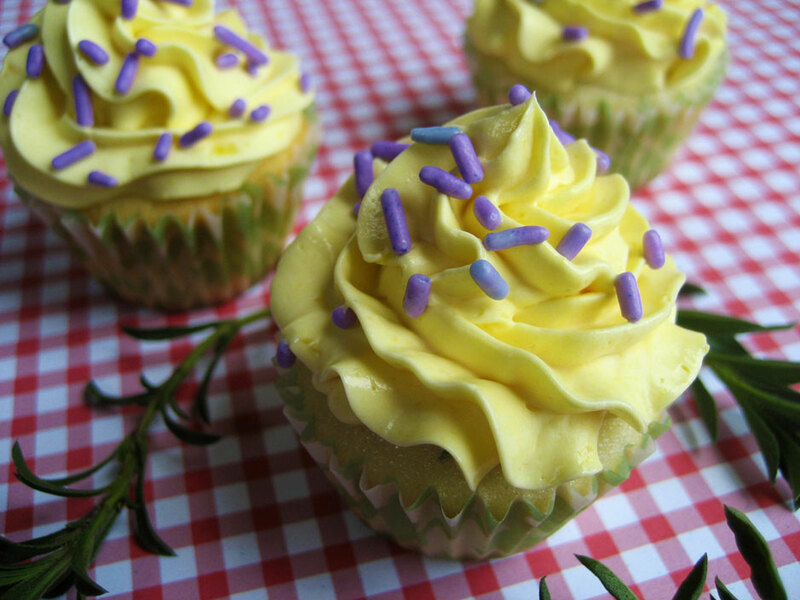 I ended up using my trusty standard cupcake recipe, with the addition of steeping lavender in the milk and adding some finely chopped fresh savory to the batter. I made the cupcakes tiny because they’re easier to share with more people that way, even with halving the recipe. Plus it’s terrifying to use an entire one pound package of butter in one frosting. The frosting, by the way, is DIVINE. Whenever I opened the cupcake carrier I’d get hit in the face with an awesome blast of lemon, and the honey ties everything together very well. I really love honey. Pour the milk into a small saucepan and sprinkle in the lavender. Bring almost to a boil, then remove from heat and set aside to steep and cool to room temperature. Preheat the oven to 350. In a stand mixer or with a handheld electric mixer, cream the butter, then add the sugar and beat until light and fluffy. Sift together the flour, baking powder and salt. Strain the lavender out of the milk and alternately beat the milk and flour mixture into the creamed mixture by thirds. Once everything is fully incorporated, briefly beat in the savory, then add the egg whites and beat on medium-high until the batter is light and fluffy. Pour into lined mini muffin tins and bake 10-13 minutes, until a toothpick inserted in the middle of one of the cupcakes comes out clean. Allow to cool fully before frosting. Makes 24 mini cupcakes. In the bowl of a stand mixer fitted with the whip attachments, beat the yolks on high until light in color and foamy. Meanwhile, heat the honey in a small saucepan to 248 degrees. Intermittently drizzle the honey in by fourths into the yolks, whipping between additions. Continue to whip until the mixture cools to about room temperature, then switch to the paddle attachment and beat in the butter one Tbsp at a time, waiting for each piece to be fully incorporated before adding the next one. If at any point the frosting appears to curdle, let the mixer run undisturbed and don’t add any more butter until the frosting fixes itself (it will, trust me). Once the butter is all incorporated, beat in the lemon zest and the food coloring. Pipe onto the cupcakes with a pastry bag fitted with a star tip and decorate with sprinkles. For a last minute, sort of jokey submission these cupcakes sure are awesome. 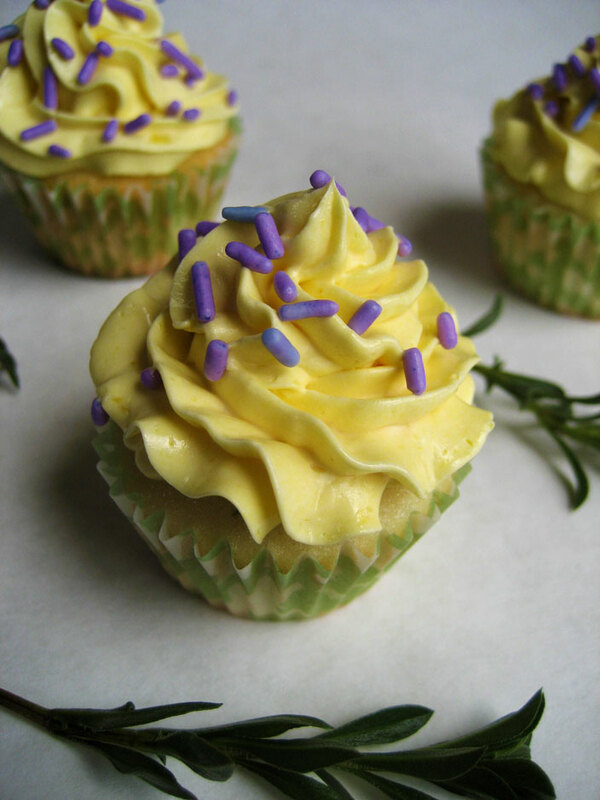 The frosting is really great and would also go great on a chamomile cupcake. Mmm, chamomile cupcake. These sound fantastic! I’m wondering how “savory” tasting they are. These sound like dessert to me, which is fine for me :) I’m going to have to try that buttercream. Buttercream has always been a problem for me because mine tend to end up tasting like a lightly flavored stick of butter. It ends up being too fatty, not what I was expecting from a home-baked good. I love the yellow and purple colors. And how interesting to use savory in it. Have not baked with that herb, but have baked with rosemary and thyme quite often. I so love the unexpected flavor they give baked goods. yu-um. 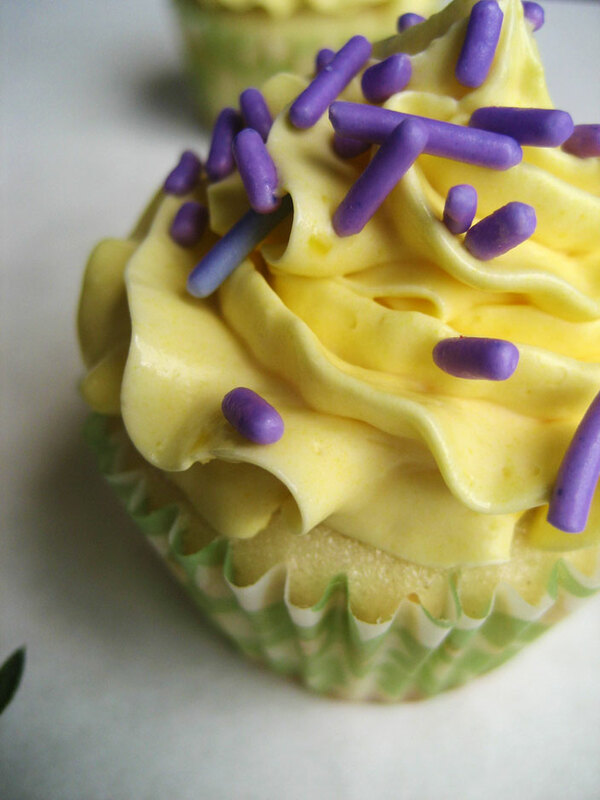 i don’t think i’ve ever tasted savory, but i think in purple and yellow mini cupcake form would be the ideal introduction. can you bring some on your visit here, pretty please? You’ve done a great job-I’m fascinated by the idea of Fatt koh now! I feel the pain of searching longingly for ingredients! I’ve never tasted anything with Savory in it, but you get my vote just because of the smartass-ed-ness (is that a word??) of your entry! What a great and creative idea! I have both savory and lavender in my herb garden, so I’ll try these….and the bonus, they are beautiful, too. Wow, these look INCREDIBLE. The frosting especially caught my eye. I’m a huge fan of anything lavender flavored but have never thought of combining it with savory; how clever of you! Great post and gorgeous photos too! It is smooth and tasty. Do you think I could replace the Savory with Rosemary? 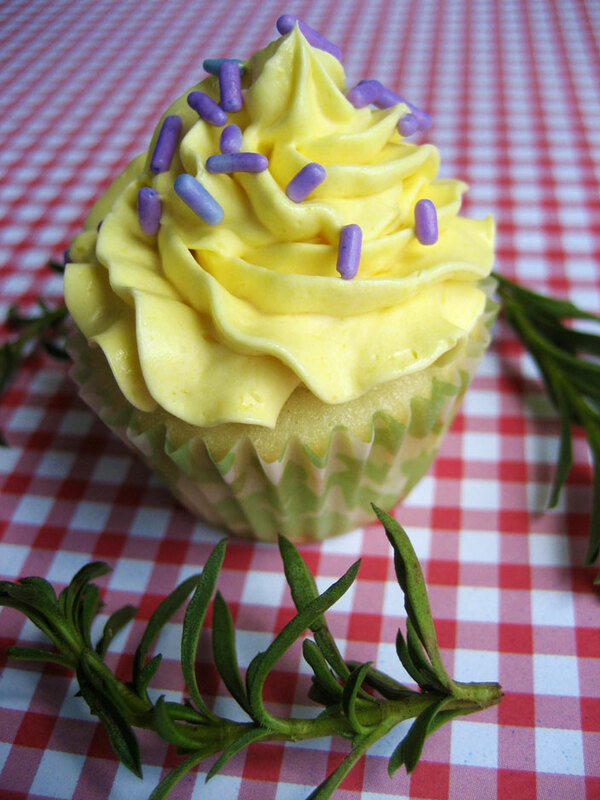 I have a beautiful Rosemary plant that I have been dying to use in a cupcake. Definitely but use a little less, rosemary is very very strong!